I have used Hock and Lee Valley replacement irons and I don’t like them. They are sharp yada yada yada but they are so much thicker than the originals you have push the frog back in order to get them to fit. I buy vintage irons in yards sales etc when I see them. Japan Woodworker has replacement irons that my buddy swears by. St James Bay tools sells replacement irons also. I stay with the thinner origianl irons – I don’t buy the thicker is better and no chatter hype. Thin irons were used for over a 100 years, why didn’t they go with thicker irons? I’ve been very happy with the Hock blade I put in my No. 3. IBC/Cosman blades also work, but I don’t like opening the mouth and they’re so thick, you end up with the frog pushed way back and it (the frog) has to be precisely place which makes the plane really fiddley. Here’s what I’ve been doing. I cambered my original blade in my No. 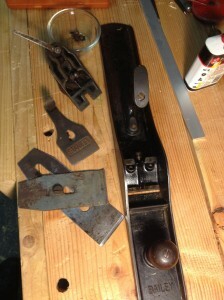 6 and set it aside for rough work (probably something you won’t do for a jointer). Then I use the new blade for regular work. Just my experience. If you need new handles/tote, I would recommend Bill Rittners (http://hardwarecitytools.com/). His handles are great. I re-hab’d a #3 about a year ago and used a Lee Valley blade and chip breaker combo with excellent results. Feels like one of my LN’s. I have also used Hocks with good results. I believe the key is not whether the blade is thick or thin but the fact that all the mating surfaces are woking together. Before the “thin” blades many old planes had “thicker tapered” blades. I agree with the caution about using thicker blades, to some extent. However, that concern is greater with a jack plane than with a jointer, which will usually be set up with a tighter mouth, slighter camber, and be set to take a finer cut. I have put a thick Hock blade on my #8 and I am pleased with the result, but this is a huge plane which I use for final flattening only. I have rescued a blade in similar condition to yours for a #5. I flattened the back and took out some of the finer pitting, and by using an aggressive version of the”ruler trick” to create a small back bevel, I can get a good edge, effectively creating a steeper cutting angle at the same time. It looks to me like your blade has a narrow band of really bad pitting. I would clean up the back a little, use the blade until you begin to hit the bad pitting, then grind past the pitting and set up a new edge. It looks like you have enough metal left behind the pitting to last for many years. The other option is to add a backbevel to the blade. 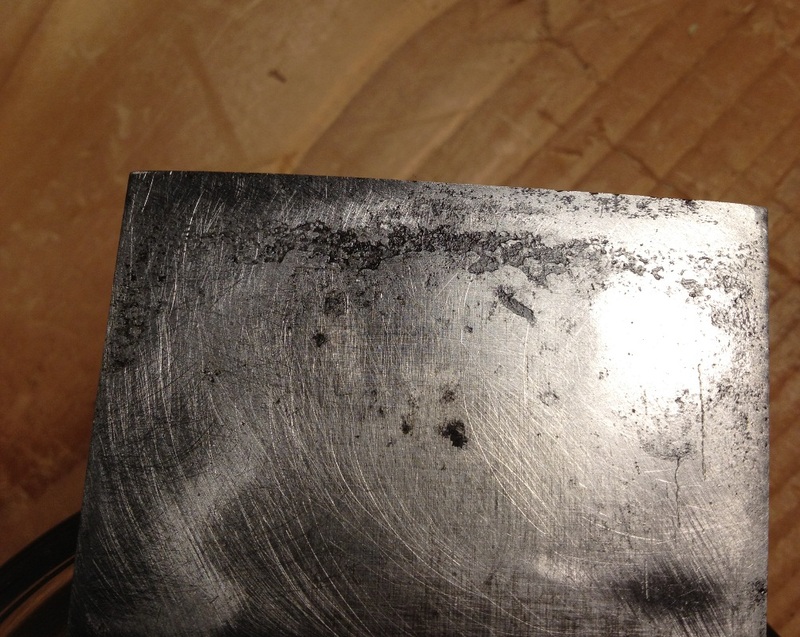 By adding the backbevel most pitting can be circumvented. The cutting edge is just the intersection of two (ideally) perfectly flat planes. By making this intersection occur at two bevels, instead of the bevel and the back, you can avoid the pits. I’ve done this successfully with several #3 and #4 blades. Thanks every one! I really appreciate the advice, I might try adding a back bevel and see if I can get good results from there. Some of the pitting is pretty bad, but I’ll give it a shot. It Costs me nothing to try, and I can always try a lee valley blade. Marilyn thanks the link to the handle/tote maker, those look great. 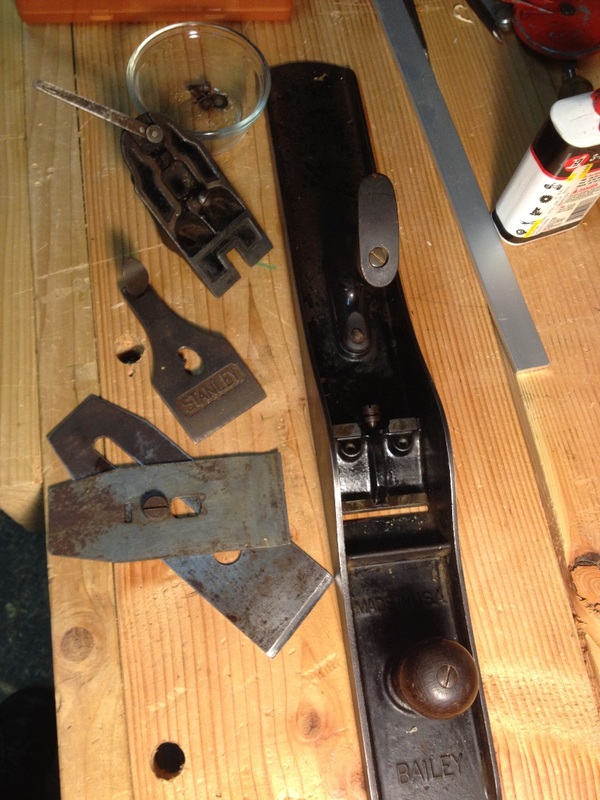 If I can get the rest of it rehabbed to my satisfaction, it might be worth upgrading the handles. The current ones are in decent shape though. You could try lie nielsen replacement stanley blades…I think they are thinner than the hock so less/no filing the mouth for chip clearance. From the photo it looks like you have some good steel there yet. Could you grind away to where the back is not pitted? MWH’s backbevel comment seems simpler though. I have Hock blade/chipbreaker setups in my #8 and #5, I’m very happy with them. Adjusting the frog to accommodate a slightly thicker blade is a non-issue IMO. With some judicious flattening and a back bevel you may be able to save the existing blade – but it’s going to make it more of a pain to sharpen every time. Also, the back bevel raises the effective cutting angle which makes it harder to push – not something *I* want in in jointer plane, although it should help on difficult grains. Sharp is everything. I was planing some fir posts yesterday with a freshly-sharpened blade in my #8 and I was taking off thick shavings with almost no effort, and I could dial it back and take of thin wispy shavings to fine tune the surface. The trick (for me) is to figure out how to get sharp faster so I don’t waste a lot of time on that part.